Rumpled and Grim – Would I Wear it in Paris? The last couple of things I made were wadders, or near-wadders anyway, and I lost my sewing mojo for a while there. Plus it’s been way too cold to take pictures outside here in beautiful downtown Vermont, and indoor pics often don’t cut it. After my denim skirt, I drafted, cut and sewed a pair of pants. I made numerous mock-ups of them before deciding to cut into my garment fabric (I hate the phrase ‘fashion fabric’ so I’m just going to say ‘garment fabric’). The mock-ups mock me. Here is what I learned about mock-ups; don’t make a muslin out of muslin. When I cut my good fabric, I thought I was closer to a proper fit than I was. The muslin, as well as the pink flannel were too soft and loosley woven to really mock the finished pants. The striped fabric is medium weight cotton, tightly woven, somewhat stiff with a little bit of stretch. So when I made them up they had more smiling than a clown college. It was bad and I was discouraged. Two wadders in a row. I put my scissors away and covered up my sewing machines for a month. About two weeks ago I pulled out the pants again. I was pretty sure I could salvage them because the smiling required a deeper crotch curve and a deeper curve required extra fabric at the sides and that I had. So I made some more adjustments, ripped and re-sewed several times. I put a waistband on it then took it off even though I’d gone through the trouble of putting a buttonhole on it. Until finally I deemed them fit for wearing to work. I took this after getting home from work today, so I looked a little rumpled and grim. See my pockets? I can put my whole hand in my pockets and have plenty of room for a few quarters and a shopping list and god knows what else. I used the pocket from a pair of my husband’s pj’s as a guide so they are roomy. Use a light-colored solid to do so. There are very few reliable pants-fitting sources on the intertubes. Even the ones that are considered reliable aren’t as helpful as they are reputed to be. I had to go back to my old pattern drafting books. I’m going to make at least another mock up of this pattern. The fit isn’t quite as sleek as I was going for. The grey shirt I’m wearing is one I made two or three years ago. It’s linen–and I know it’s a little early for linen–but I couldn’t really stand to wear a t-shirt again. All winter I’ve been wearing jeans and t-shirts and I needed a break. One of my co-workers asked me if my shirt was a J. JIll which I took as a compliment. Instead of tie on the side, I used a cover-your-own-belt kit and made a small belt on the side. I love this detail. So now that I am back at the needle, I am trying to work my way through some of the bulkier items in my stash. I just cut out a bathrobe from a piece of cozy sweatshirt fleece, so keep an eye out for that! Pants/trousers are so hard to fit. I am trying to. Close, but still trying! The other thing that was really helpful was taking pictures of the back. (My husband was a willing helper there). It’s impossible to see things straight on twisting around to look in the mirror. I know! I feel my jeans fit right but when I look I see wrinkles everywhere. My daughter tells me there are a few, but she is not sure of what she is looking for. Yes, I find the ‘fashion fabric’ term cloys too. From the photos, and accepting the after work status, the pants fit looks pretty fair. 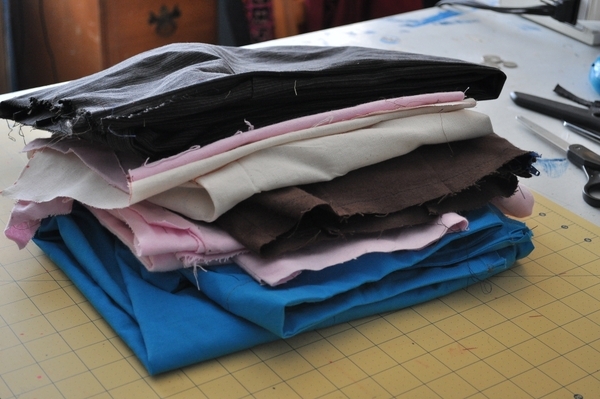 My stash mainly consists of a heap of cheap fabric in various weights which I use for the first run through of patterns. Lookin’ good! Glad you tried again, ’cause the result is great. Just FYI: even though I have a solid background in flat pattern, my best pant pattern results yet were from Sarah Veblen’s on-line class via patternreview.com. Best $20 I ever spent!